At long last, we have settled on the final cover art for The Ghosts of Ravencrest’s 5th installment, Night Moves. I know I said I wanted something with lots of red for this installment, but as soon as I saw the completed version of this one, I knew it was the right cover. I love it, and I am excited to announce that Night Moves will be available to buy later this week. 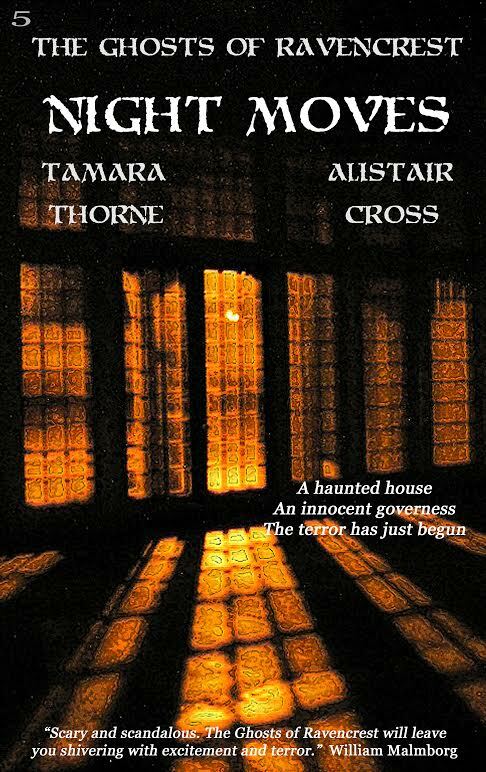 The Ghosts of Ravencrest is a serialized novel. A new installment is released about every four to six weeks. Although the installments vary a little in length, they average about 10,000 words, each. With the inclusion of Night Moves, the entire Ravencrest saga is currently at about 50,000 words. Within the next three or four installments, this story arc will be completed and compiled into a full- length novel. After that novel’s release, we plan to continue the story, with a new story arc, in the same format as the first (serialized installments). For the whole story – so far – you can buy the first four installments at Amazon. The first three installments (The New Governess, Awakening, and Darker Shadows) are available in an omnibus edition titled, The Ghosts of Ravencrest: Darker Shadows. The novella-length Christmas-themed fourth installment, titled, The Ghosts of Ravencrest: Christmas Spirits, is also available and can be read as part of the series, or as a standalone. Click the images below to buy the installments, and thank you for loving this series enough to allow us to continue writing it!